This is one of those lazy day makeup looks I would usually don because it wouldn't take forever to apply. 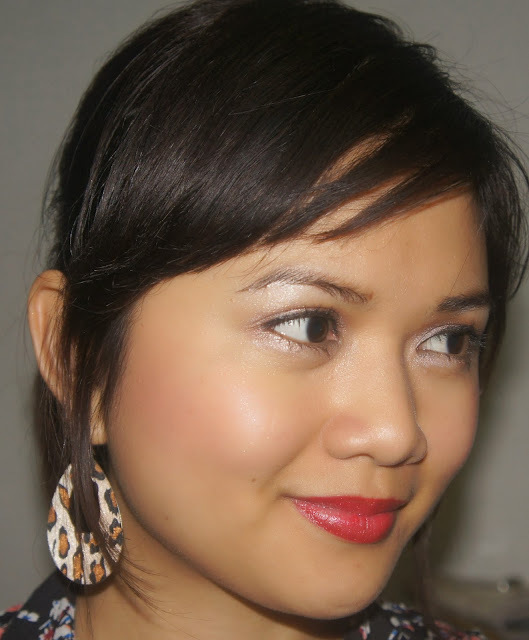 Here I'm using a taupe eyeshadow color on my eyes paired with a bold lip tint. 2. Appy taupe eyeshadow color to your entire lids as well as the lower lids. For the lower eye lid, apply 3/4's from the outer corner of your eyes. 4. Blend the eyeshadow application. Get rid of harsh edges and blend it up to the crease area. 5. Apply black eyeliner as close to your lash line as possible. 6. Curl your lashes and apply mascara. 7. Make your cheeks blush. 8. Apply a bold lip tint. Then you are ready to go! Its that simple and very easy to do. Try it yourself and experiment.